SEB is creating a separate financial furrow to channel capital into green projects. Friday 10 February, the bank issued its first green bond of 500 million euros. The 500 million euros raised are earmarked for loans to green initiatives. ”For all lending, we will have a dialogue with customers if the loan is intended for green initiatives. This contributes to helping raise awareness on environmental issues, "says Joachim Alpen, Co-head of Large Corporates & Financial Institutions. SEB took the initiative when the World Bank in 2008 issued the first green bond for institutional investors, and it has ever since been a leader in the development of the global market for green bonds. 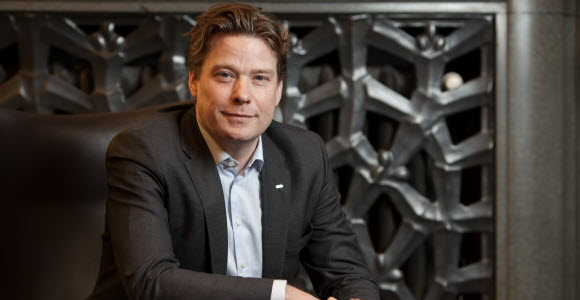 So far, this has meant that SEB has arranged issuance of green bonds for other market players in a wide range of sectors in the Nordic region and globally. In total SEB has facilitated the issuance of green bonds at a value of 13.8 billion dollar. But now the bank for the first time is issuing its own bonds, earmarked for customers' green loans at SEB. It can be described as the bank opening a separate stream for green financing that spans the entire chain from the bank's own financing in global capital markets to each individual loan. These green loans will initially be offered to large companies and institutions, municipalities, county councils and housing associations. “We strengthen our environmental dialogue with customers through, alongside traditional financial issues, conducting dialogue about environmental issues in a more systematic way. This helps to strengthen and deepen relations with both borrowers and investors,” says Joachim Alpen. Ahead of the release of the green bond, SEB has gone through the loan portfolios of the entities involved and selected and separated the loans which comply with the bank's framework for green bonds. Investors should be able to be sure that the money they lend only goes to green lending. Therefore, SEB has implemented new internal procedures to ensure the quality of green loans in accordance with its green framework. Financial terms of green bonds and green loans are the same as for other bonds and loans. For investors, it is about combining good returns with money being used for a well-defined purpose that is in line with their sustainability ambitions. For borrowers, the logic is the same - they combine good financing with seal of approval that the project is green. What types of loans qualify as green? This involves clearly defined projects within renewable energy, energy efficiency, green buildings, clean transport, water and waste water management, waste management, sustainable forestry and clean air. The environmental aspect of SEB's green financing is quality-assured by independent, external climate and environmental research institute Cicero, through its expert network of independent universities. In addition, the audit firm PwC will analyse whether SEB's processes and systems for separating green borrowing and lending is rigorous and in line with SEB´s frame work for green financing.